Since its early museum and gallery projects, Stanton Williams architectural practice has expanded the scope of its interests and specialisation, designing buildings for a variety of different functions; the practice currently has projects of a number of different kinds underway or recently completed. In France, for example, the studio completed the Musée d’arts in Nantes in June 2017, while in London it is working on projects such as the new Great Ormond Street Hospital research centre, a major educational project for UCL East Marshgate, the Museum of London West Smithfield and the Royal Opera House, due to be completed in 2018. Simon Sainsbury Centre for Cambridge Judge Business School recently completed at Cambridge University shares a number of features common to all Stanton Williams’ projects, what we might call the basic principles of the studio’s work: the human experience of users in the architectural space, light and materials. To this we may add the desire, or rather, the fundamental need, to design places that respond to and fit harmoniously into their cultural, social and physical context. A way of working that has won the studio important awards and rankings on the international architecture scene, RIBA Stirling Prize 2012 for the Sainsbury Laboratory (SLCU), another project for Cambridge University. The new building opened to students recently, in January of 2018, but its construction began to mark the twenty-fifth anniversary of the founding of Cambridge Judge Business School in 2015. 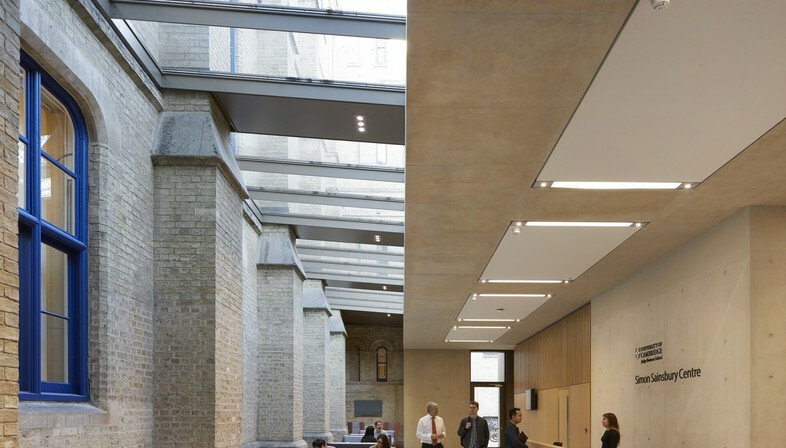 Architect Gavin Henderson, director of Stanton Williams, presented the project by summing up its essence in a few words: incarnating the school’s identity, satisfying its needs of today and adding another piece to the puzzle of transformation of the stratified historic site that is Cambridge. Cambridge Judge Business School was designed by British architect John Outram in 1995, replacing and reorganising the old Addenbrooke hospital, a building which had in turn been reconstructed and expanded in 1866 by architect Matthew Digby Wyatt. 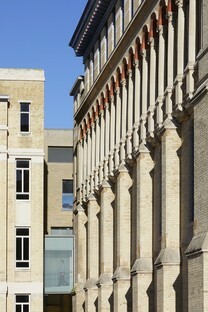 Simon Sainsbury Centre adds about 5000 square metres to the total floor space of Cambridge Judge Business School. The architects of Stanton Williams designed a building complementary to Outram’s, knocking down an old students’ residence on Tennis Court Road, on the eastern side of the site, to make way for the new construction. The Simon Sainsbury Centre responds to two of the school’s requirements: concentrating in a single building both academic programmes and executive training programmes, which were originally held in other locations in and around Cambridge. In this way the school becomes a versatile hub offering an important meeting place for students and partners from outside the university. The new centre also provides flexible spaces for use not only in educational programmes and conferences, but as studies, offices and dining halls. A vast range of possibilities, for spaces that can adapt to the changing needs of learning today and promote interaction between different categories of users. The architects of Stanton Williams drew their inspiration from the historic brick façade designed by Matthew Digby Wyatt, picking up on the rhythm generated by the alternation of brick buttresses and stone columns. The new extension’s height marks a return to the scale of the original hospital complex, as do its bold colours and well-defined materials. Inside the complex, it is easy to distinguish between the structure of the original 19th century building and Outram’s late twentieth-century transformation. The new centre is an element joining the complex to its urban context once again, restoring a unified look to the whole which transcends the styles of individual constructions.